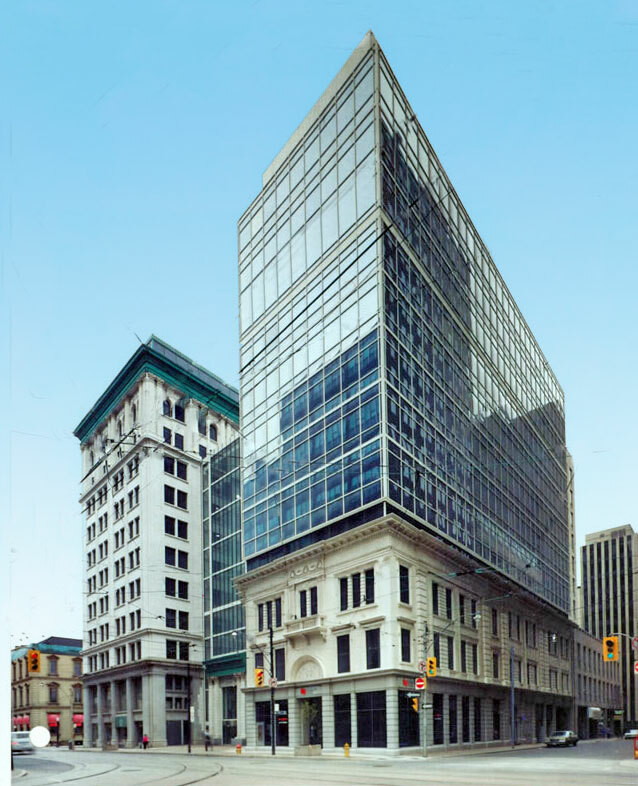 Extensive structural modifications were carried out to the adjacent historical building due to the vertical addition of three new office floors, which were framed in steel using composite deck and composite beam design. In order to support the existing three storey brick and stone facade during construction of the tower, a temporary bracing system was designed employing steel beams and trusses. This temporary bracing supported the free standing wall until it was connected to the new tower slabs. The historical character of the development was maintained by the retention of the original existing building facade at the base of the new tower. The columns extend down through three levels of underground parking and are supported on caissons socketed into shale bedrock. The new tower consists of reinforced concrete flat slab construction with column spacings up to 8.5 metres. The slab thickness is typically 220mm, with 110 mm drop panels.